your All Season Control Cover custom designed and built to suit your chimney. Your house is leaking. Fix it! Cover your chimney with an All Season Control Cover. In the winter, a fireplace can be the focal point of your home, providing families and friends with warmth and comfort. 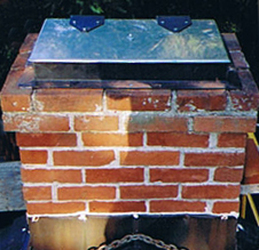 When you are not using your fireplace, the chimney top can be sealed shut to avoid heat loss, cold drafts, and invading critters like birds and raccoon looking for a warm place to nest. The All Season (Chimney Top) Control Cover, by Benson Energy will generally pay for itself in one winter.